Unfortunately, the photos I took at Burning Man have been lost, and at this point, I don't have much hope of them ever turning up. So in lieu of showing you BM through my lens, I've scoured Flickr for pictures that other people took at Burning Man 2008, searching for images that accurately reflect my experience of the burn, and the things I remember seeing there. So, go ahead and browse through these images and see, through the eyes of many, a small glimpse of what it was like for me, living out there on the playa for a week. Black Rock City - This is Black Rock City, so you can get the right idea. When I mention the city, this is what I'm talking about. And those dust "roads" - those are the streets. Welcome home! You get more and bigger art installations as you go in towards the central open circle. Bird's Eye View - From a bit higher up. Not that I was privy to this view, but it gives you a good idea of the shape of the city. The Man lies at the very center of the circle. The Man, From A Distance, Path To The Man, Lit Up, Burning - Exhibit A, The Man. The heart of the burn. 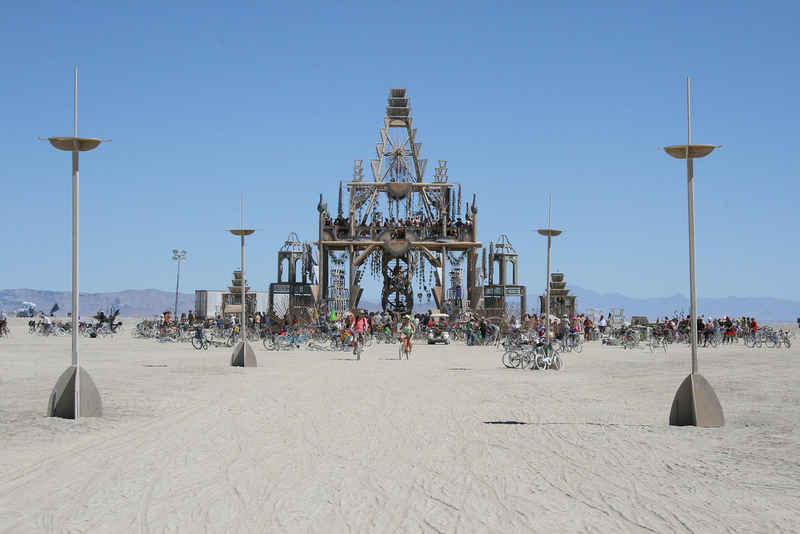 The Temple, Approach - This is what the Temple looked like, in the full light of day. If the Man was the main exhibit, this would be exhibit B. I believe the Temple was supposed to be made entirely out of recycled garbage. It certainly was an amazing structure. You could go up on the upper floor, too. Trash Fence - This orange trash fence borders the perimeter of the officially-sanctioned event grounds. Even at the closest points, though, it's still a decent trip from the edge of the tented portion of the city. Soft Playa - I don't have any experience to judge from, but reports say the playa was extra soft and sandy this year. What I do know is that it was very difficult to bike over in many places, especially the open stretches. Arctica - A real life saver. This is where you can buy bags of ice. Tower of Babylon - This is the tower I mentioned a couple times in my journal. As you can see, it's huge. It sat out in the deep playa, and provided a great view of the surrounding desert, and Black Rock City. Twilight Horizon - The mountains just glowed beautifully in the light of the setting sun. Whiteout - This is what it looks like in a whiteout on the playa. It's *very* cool. Smoke Ring - This was a common sight in the evenings during the transition from day to night. Long Shadows - Another familiar sight, in the mornings and evenings - though more so in the evenings, since I spent most mornings in bed. Ketchup Bottle - Serving hot fresh potato fries at night. The one time we stopped by for fries, they were all out of ketchup. Talk about a sad twist of irony. UFO (a), (b), (c) - This UFO was probably one of my favorite art installations. In addition to just being cool, it also served as a great landmark that I could see from across the central open playa, to help orient myself and get headed in the direction of our home camp. Storm Troopers - I saw these guys keeping the peace one day on my way through the city. The End - All the way out at the end of the path, right up against the trash fence, in the deepest part of the deep playa, was this monstrosity. Spider Borg Vehicle - I actually saw this thing cruising through the streets of Black Rock City one day. What a sight. Sand Sharks, Fin - This is another one of my favorites. Giant shark fins sticking out of the sand, in the deep playa. Very cool. Spread Eagle - It spins, to align with the wind or something.